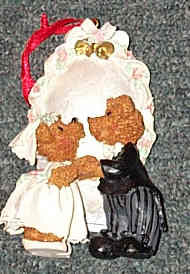 Resin Wedding Bears Ornament; 4.25" resin wedding bears (bride & groom) with a background that can be personalized with the bride & grooms name. This is great for a wedding gift topper or for a first..
Resin Wedding Bears Ornament; 4.25" resin wedding bears (bride & groom) with a background that can be personalized with the bride & grooms name. This is great for a wedding gift topper or for a first Christmas ornament.